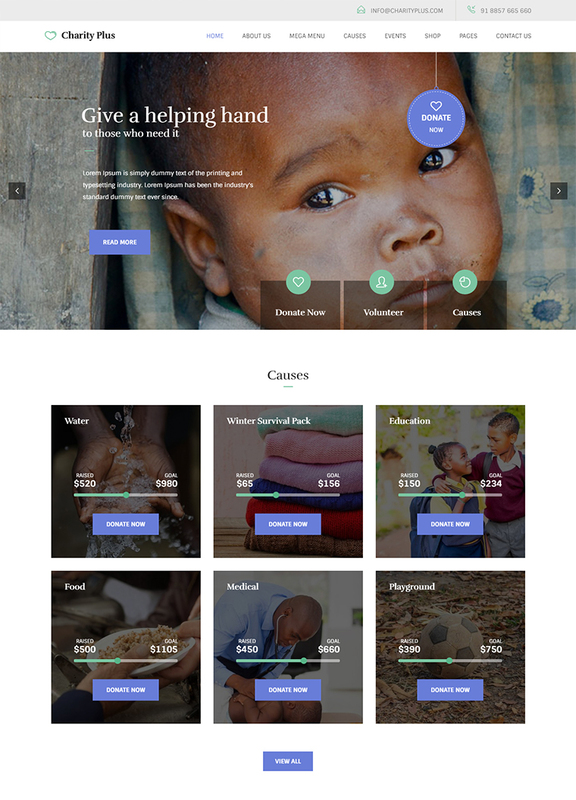 Powered by Bootstrap 3.0 and Visual Composer, CharityPlus WordPress theme is an ideal option for any non-profit organization that wishes to have an awesome online presence without any hassle. Developed using the latest and advanced technologies, this crowd-funding WordPress theme comes with myriad of features that are sure to cater all your needs and demands. 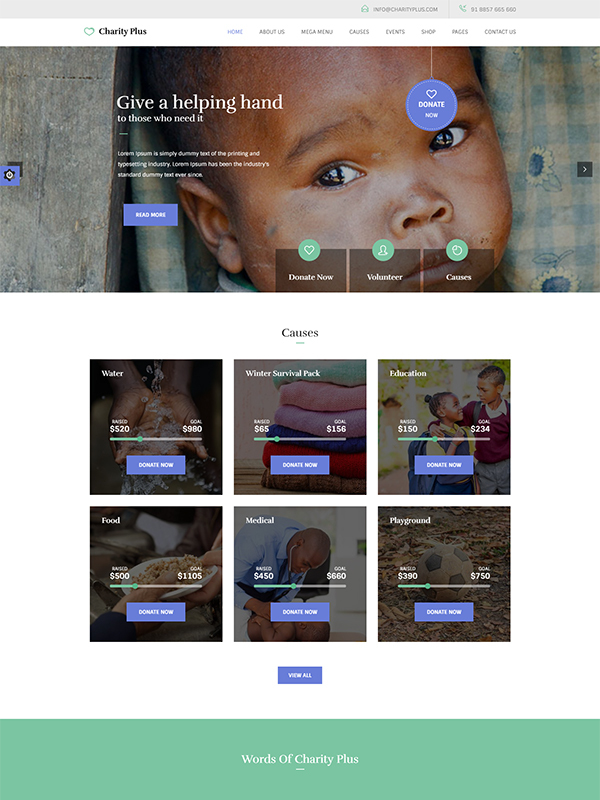 Being fully responsive, this NGO WordPress theme is incorporated with W3C validated markup. This fundraising WordPress theme is designed in a way that it can be opened in any sorts of device and gives a wonderful experience to the users. Equipped with Google Web Fonts, this theme allows you to simply add customized visual appearance with varied font options to the website with ease. High definition pixels have been configured in the website that sharpen the discernability and display. The images used in the theme are of HD quality. Any website is incomplete in the absence of sliders and banners. Revolution slider can be useful in adding sliders and banners to your website without any hassle. CharityPlus theme is created in a way that it causes no problem at the time of installation. You just need to click on one-click install button. A wide range of color and font options are available that allow the users to select the perfect color and fonts for designing the website as per their desire. This CharityPlus fundraising theme enables the companies to design highly appealing and unique website without making much efforts. Packed with distinct features such as newsletter support, event manager support, RTL support and many others, this theme can be highly beneficial for any non-profit organization, charity, NGO, foundation, fundraising or governmental social program website. Style variations with unlimited possibilities. Fixed, sticky & intelligent sticky header. CharityPlus WordPress theme is built using optimized and validated code that ensures that the website loading speed is up to the mark. 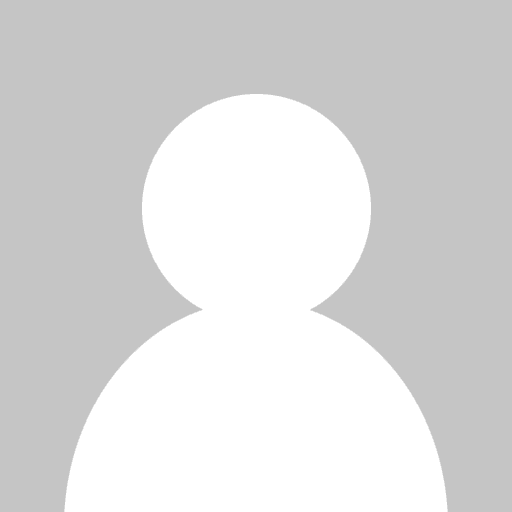 This plugin enables your users to contact you directly by just filling a form on the site without any trouble. You can add the form at any place of the site. Equipped with WooCommerce support, CharityPlus theme also comes with shopping cart feature that added as a part of the theme. This theme comes with Google Map API that allows to show the exact location on the map that assists the users to find your way with an ease. The NGO WordPress theme comes with the MailChimp compatible feature that allows you to send email to the users subscribing to your newsletter. With the help of Visual Composer that comes with this theme, you can easily create an array of pages with groundbreaking features.